"Then, of course, there was the hugely ambitious plan, driven largely by Summers, to develop a second campus across the Charles, in Allston. The land purchases and the planning cost millions and millions; the actual construction of the 350 acres of new housing, laboratories, museums, parks, and athletic facilities would cost billions and billions. Just the projected maintenance for the first building under construction, a $1 billion new home for the Harvard Stem Cell Institute, has been said to be $100 million a year. This February, Faust announced that the university would finish the basement, then stop work on the project. She has said the halt is temporary, but few are convinced. 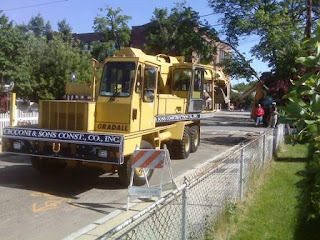 Allston residents worry that their neighborhood will be left with a massive hole in the ground." Urban Outfitters will open its fourth store in Greater Boston, having signed a lease for 13,500 square feet in Allston, Mass. The BRA talked more about the housing for the Holton St Corridor last night, and told us that the goal was to create an "amenity rich" neighborhood. There has been a lot of talk about new parks and some discussion about new retail along Western Ave, but many residents last night talked about a key amenity that is currently missing from the BRA's plan and stressed that a K-8 is a top priority to attract families and long-term residents and create a more stable community. Our neighborhood is fortunate to have a great school in the Gardner Pilot Academy, but that ends at 5th grade and I know families who consider leaving the neighborhood in favor of a neighborhood where their kids can have more continuity in their education. The 700 units of new housing proposed last night means approximately 2000 new neighbors and something like 200 new kids. Even for the existing K-5 population the Gardner is already bursting at the seams. If we are going to build all this great new housing we need to have a compelling answer to prospective homebuyers and renters who will ask "Where will my kids go to school"? The first Boston T Party will embark from Brighton's Washington St stop on Sunday at 7pm. Sounds like fun! The best thing to happen on Western Ave in a long time is that Mahoney's Garden Center has a new 10-year lease. If you haven't been there recently, they have significantly increased their selection and quantity of plants and, with so many plants flowering, it is more beautiful than ever. A neighbor asked me yesterday why so many newspaper stories mention the rats of Allston. Apparently there aren't many of them where she lives, but I told her that there is no shortage of them in other parts of the neighborhood. 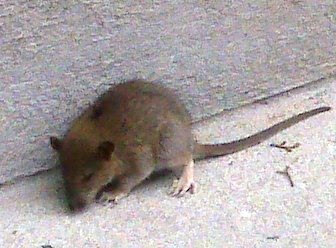 For example, here's a furry little critter I saw on my neighbor's front steps this morning at 8:35 while walking my dog. Twenty five minutes later it was still there sitting there on the same step. These days we are in the dark about how various forces will change our neighborhood in the upcoming years. When will Harvard finish its Science Complex? What type of development will replace the KMart and the rest of the Holton St Corridor? When will many of the improvements described in the North Allston Strategic Framework actually be done? So I was intrigued by this headline and story about how uncertainty affects people's happiness, and I found it ironic that is it written by a Harvard professor, considering that Harvard is the driving force behind so much of the uncertainty and mystery about our future. Which way is our spiral? The cover story in the current edition of the Yale Alumni Magazine looks at the New Haven Renaissance and Yale's role in helping it happen. One example of Yale's positive and stabilizing impact is that since 1994 more than 900 Yale employees have purchased a home in New Haven with as much as $25,000 in financial assistance from Yale. Each dot on the map of New Haven represents a home purchased through Yale's Homebuyer Program. Wouldn't it be great to have for North Allston and North Brighton to have a similar town-gown integration, a shift from absentee landlords to homeowners, and more people walking or biking to work? Friday from 1-2 on WBUR (90.9 FM), Radio Boston will talk with the candidates for Mayor of Boston. Thank you to Mayor Menino, Boston's Department of Neighborhood Development, the Allston Brighton CDC, the New England Foundation for the Arts, and everyone who joined us this morning to celebrate North Allston's first and only public art installation. Improving this strip of land on Lincoln St between Royal and Mansfield streets was a long and interesting experience that started approximately 14 years ago. On Monday morning at 11:00 we will celebrate the project with Mayor Menino, the Allston Brighton CDC, the New England Foundation for the Arts, and others. If you aren't familiar with the site or as a reminder of what it looked like a few years ago, here are a few before and after views. 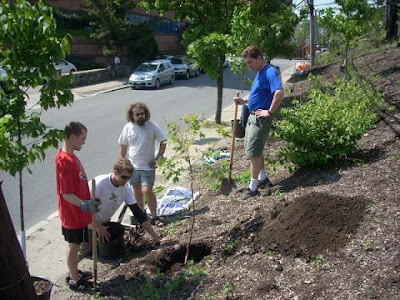 Thanks to Grow Boston Greener, Mahoney's Garden Center, and the dozen-plus neighbors who came together this morning to help plant 17 new trees on the Everett St slope alongside Lincoln Street. We have made incredible strides since the ABNNF adopted this site last year and it was great to work alongside many familiar faces and some neighbors I had never met before. All the planning meetings we attend month after month haven't accomplished much in terms of physical improvements in our community, which makes it all the more gratifying to be able to get our hands dirty while turning this sliver of land into one of the greenest and most attractive places in our neighborhood. Hopefully this will be the beginning of a trend! This excerpt pretty well sums up the meeting. As a community I think we did an excellent job of focusing the meeting on the social and economic issues that are more likely what will make the new development of Charlesview a success or failure. Clearly we are going to insist on a lot more detail than just yellow squares on a map labelled "housing". "While BRA officials had intended to focus largely on street grid and park design in Allston’s Holton Street Corridor at Wednesday night’s Community-Wide Planning meeting, discussions instead turned towards considerations of mixed-income and affordable housing in the future neighborhood, as well as the density and connectivity of the planned residential communities." 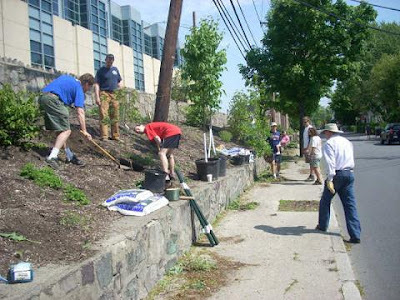 In cooperation with Grow Boston Greener, we will do some spring cleaning & plant trees on the Everett St slope between Lincoln and Adamson. Please bring a shovel or rake and lend a hand! Harvard announced last night that they have made a deal to buy the Supply New England property between Seattle and Windom Streets. Harvard doesn't own it today, but the deal means that Harvard will own the property in no more than 10 years. Also, Harvard stated that they will not purchase any property in A/B for the next year. Considering Harvard's dire financial situation, it doesn't come as much of a surprise that they will spend their limited resources on their current campus instead of more property that won't be developed for decades. "On Tuesday, May 12, at approximately 12:21am, Officers assigned to Area D-14 (Allston / Brighton), responded to the area of Coolidge Road @ North Harvard Street for a report of a robbery in progress..."
Cape Ann Fresh Catch is trying set up the fish equivalent of a CSA - you pay a fixed amount at the beginning of the season to get a variety of fish each week for 12 weeks. There has been a good amount of interest in the Cambridge/North Allston area, so hopefully there will be a convenient pick-up location for us. Right now they are exploring how many people are interested, not looking for a commitment. More info is available at their website. "But after two decades of service up a slice of Japan at the area's sole Japanese-only market, Shinohara will soon be saying farewell. Lesley University, which owns the Massachusetts Avenue building where the market is located, wants the space for its bookstore." Harvard's largest division, the Faculty of Arts and Sciences, has announced a new round of budget cuts. New construction in Allston is not specifically mentioned, but this section on the capital budget suggests that there won't be any new institutional development in Allston any time soon. "Relative to the capital aspirations from one year ago, FAS has reduced the capital plan for the next two years by more than 50 percent. Only projects that are cash-funded or critical to the maintenance of the FAS’s primary mission – such as essential life-safety upgrades and expenditures associated with faculty recruitment – will be funded in the near term." I think the Boston Public School's 5-zone school assignment proposal has a lot to offer Allston/Brighton. If approved, this plan would put families, students, and schools in Allston and Brighton into a zone exclusively for students who live in Allston and Brighton. The result would probably be more parental involvement, more kids walking to school, and a strong community that would attract more families to our community. "In the 1990s, the university wanted to build a Renzo Piano-designed museum on the banks of the Charles River to house its art collection. The North Allston "neighborhood," in reality a very small number of residents, blocked that plan because it would affect their views of the river blocks away." But that isn't what happened. The proposed museum that Ben is thinking of was in Cambridge, not North Allston, at the intersection of Memorial Drive and Western Ave where Mahoney's was before it moved to North Brighton. For years after that, as Harvard tried to cement its plans to build a new science campus to educate the nation's future biologists and chemists, the area's residents fought back tooth and nail. This also couldn't be further from the truth. Harvard was allowed to amend its Master Plan to build the Science Complex in as rapid a process as possible and nobody in North Allston did anything to slow that down. All that despite the promise that Harvard made in the North Allston Strategic Framework to collaborate with the City and community on a new master plan before starting any specific projects. There are a lot of great things about how the Internet allow people to share ideas and information, but the ability to spread lies like these isn't one of them. A story about cities across the country seeking voluntary payments from tax-exempt universities leads with the impact of Harvard's land banking and slowdown in Allston. Thanks to the TAB for recognizing the $3,000 grant that the Allston Brighton North Neighbors Forum (ABNNF) recently received from the Boston Grants Initiative at the New England Grassroots Environment Fund. ABNNF was one of 17 groups to receive funding out of the 31 groups that applied. This grant will allow us to continue the great work that we started last year to improve the slope along Everett St between Lincoln and Adamson. Harvard Police to close Allston substation? "The Harvard University Police Department said yesterday that it is not planning to close its Allston substation as a result of University-wide budget reductions—even though a HUPD sergeant seemed to suggest at an Allston construction management meeting Wednesday night that Harvard was considering such a move." Here's a before & after look at the ugly chain link fence that Harvard removed from the Everett St side of their Lincoln Street building. This afternoon while walking around the Holton St Corridor with neighbors and staff from the BRA and Harvard, I noticed that Harvard has cleaned up where the "Big K" sign used to be on the former KMart building. Here's a photo from the archives of what it looked like for the past few years. One of the most artistic and hidden events of the year comes to Barry's Corner next week. More info here. "More than 200 people packed the public hearing to argue the merits of BC's sweeping, $1 billion construction master plan, which was passed by a 9-to-1 vote. Public discussion, at some points heated, lasted for more than four hours, with Zoning Commissioner chairman Robert Fondren gaveling the room back to order numerous times." The Allston Brighton North Neighbors Forum is meeting Thursday, May 7 from 6:30-8:30 at the Gardner School (30 Athol St). Mayoral candidate Kevin McCrea will join us and we will discuss the ongoing planning for North Allston and North Brighton. Could BC's construction impact big pipes? "With the city's zoning commission poised to weigh in on the university's plan tonight, the neighbors and environmentalists - including the Conservation Law Foundation and a former head of the Massachusetts Water Resources Authority - want the panel to refrain from voting without a fuller review of how the expansion might disrupt the regional water mains." Will Harvard do what Penn did? If Harvard is serious about being a "partner" in Allston and being a part of the community, it could learn a lot from what UPenn has done. Harvard president Drew Faust saw this first-hand when she was a professor there, but is she ready to follow suit herself? Thanks to the Globe for this reminder about the good that a university can do while it does good for itself. "Penn never pretended to be performing public service. Its massive investments in the community, school officials said, were designed to improve the university. It stopped making excuses, fronted the money for projects large and small through good and recessionary times, and got the job done. Even now, construction continues, just as it did during the downturn in 2001 and 2002."